A combination of liquid crystal molecules (mesogens) and polymer network can form a new material—liquid crystal elastomer (LCE) as shown in Figure 1. The special molecular combination endows LCE with many unique properties such as soft or semi-soft elasticity and multi-responsiveness, which have led to myriad applications ranging from artificial muscle to stretchable optical devices. Figure 1. 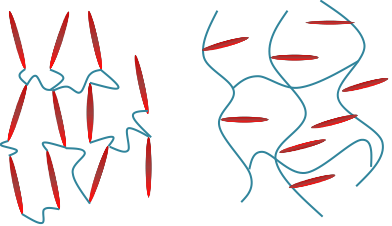 Molecular structure of main-chain liquid crystal elastomer (left) and side-chain liquid crystal elastomer (right). The rod like molecules are mesogens. In the jclub, we would like to discuss some recent advances (in the past five years or so) in liquid crystal elastomers in material synthesis, fabrication and applications. We will skip the most fundamental introduction of LCE, which can be found in the excellent book by M. Warner and E.M. Terentjev , pioneers in the field. In addition, there have been several excellent review papers on liquid crystal elastomers published in different journals [2-5]. Considering a large body of literature of LCE published in recent years, it is also noted that the review is by no means complete. Although the successful synthesis of LCE can be traced back to 1980s (if not earlier), making liquid crystal elastomer in the lab has been challenging to most researchers (certainly include most mechanician) who do not have systematic training in chemistry till recent progresses made by Yakacki , Ji and Verduzco . To realize actuation of a free-standing LCE induced by external stimuli, liquid crystal mesogens inside a LCE need to be alligned in macroscopic scale, known as monodomain state. However, this alignment is difficult to achieve. Without careful treatment, LCEs are usually obtained in polydomain state with many tiny liquid crystal domains randomly distributed, which is analogous to polycrystalline metal. Various techniques have been developed to fix liquid crystal mesogens in monodomain state through polymer networks in recent decades. They can be simply categorized into three methods according to the step of liquid crystal mesogen alignment. Due to the employment in display technologies, the alignment of low-molar-mass LCs has been greatly developed. It can be achieved under surface alignment, electric field, magnetic field or polarized light. As its name implies, LC pre-alignment method is using these well-developed techniques to make the polymerizable low-molar-mass LCs aligned in macroscopic scale first. Then, further polymerization fixes these aligned low-molar-mass LCs into monodomain LCE through newly formed polymer network. For example, Liu et al. filled a mixture of liquid crystal monomer, crosslinker and photoinitiator into a 20 μm thick anti-parallel surface-rubbed LC cell . They heated the mixture to isotropic phase, then cooled it down slowly to liquid crystal phase and kept the temperature. The liquid crystal mesogens assembled along the direction of surface rubbing. Light irradiation initiated the polymerization and monodomain LCE was obtained. White and his co-workers used photoalignment techniques of volumetric elements containing discrete aligned azobenzene-based domains as surface template . After filling the cell with a mixture of polymerizable LC monomers, crosslinkers and photoinitiators, the directors of LC monomers aligned to the local surface orientation of photoalignment layer. The local volume elements could be as small as 0.0005 cubic millimeters. They used this method to program LCE film exhibiting localized actuation behavior. In addition to surface alignment techniques, magnetic field or electric field can also be employed into align the LC director. Keller and his coworkers developed a formulation using magnetic field to make aligned LCE pillar array [8-9]. Cui et al. used this formulation to fabricate adhesive patterns of LCE which showed reversible switching between adhesive and non-adhesive states upon heating and cooling . In LC pre-alignment method, the low-molar-mass LC monomers are heated to isotropic state and then cooled down slowly to liquid crystal state in the presence of surface alignment layer or external field. The surface alignment layer or external field will make the LC monomers aligned in macroscopic scale. Further polymerization results in aligned LCE film. Either photoinduced free radical polymerization or polycondensation with slow reaction rate can be employed in the polymerization of LCEs, which broadens the choice of LC monomers. However, in the presence of external field or surface alignment layer, the aligning can only work across thin film below 20-30 μm. It is very difficult to make a large aligned LCE film. In addition, it is still challenging for many researchers combining photoalignment and surface alignment techniques to make localized aligned LCE patterns. In the next part, we will introduce a simple and robust method using mechanical stretching to align the LCEs macroscopically. In 1991, Finkelmann and his-coworkers reported two-step polymerization method to make monodomain LCE for the first time . In the experiment, two cross-linking reactions with significantly different reaction rates were employed. The alignment was achieved through mechanical stretching. In the beginning, the fast cross-linking reaction happened to form a loosely crosslinked polymer network. After the completion of fast cross-linking reaction, uniaxial stress was applied onto the light-crosslinked LCE sample. The LC monomers were aligned along the direction of applied stress. Then, the slow cross-linking reaction proceeded in the stretched LCE to fix it into monodomain state. Afterwards, lots of two orthogonal polymerization reactions have been utilized in two-step polymerization method. Liu et al. used acyclic diene metathesis polymerization (ADMET) to synthesize uniaxially aligned main-chain LCEs . Yakacki et al. combined thiol-ene Michael addition reaction and free radical polymerization of vinyl groups together to make monodomain LCE . All the chemicals used in Yakacki’s recipe are commercially available, which is friendly to mechanicians. They also released a video about the experimental procedures on JoVE . The patterning of LCE can be easily controlled using mask. In our group, we applied inhomogeneous and anisotropic stretch field in a lightly-cross-linked LCE sample to make patterned LC molecular orientation . The birefringence observed under polarized microscope indicated the LC orientation field in the obtained LCE film. The obtained patterned LCEs have shown different active deformation modes upon external stimuli (Figure 2). The strain engineering strategy we developed can be easily applied to fabricate various LCE structure which mechanicians may be interested in. Figure 2. (a) Schematic of LC molecular orientation in the LCE sheet with a circular stiff region in the middle; (b) Polarized optical microscope images of the LCE sheet with two different angles with respect to the analyzer; (c) Reversible thermally driven undulation in patterned LCEs with a circular constraint in the middle; (d) Schematic of LC molecular orientation in the LCE sheet with a square stiff region in the middle; (e) Polarized optical microscope images of the LCE sheet with two different angles with respect to the analyzer; (f) Reversible thermally driven undulation in patterned LCEs with a square constraint in the middle . Dynamic covalent chemistry (DCC), in which the covalent chemical bonds can be exchangeable has been paid much attention in chemistry community. It is widely utilized to make self-healing materials, reprocessing materials etc [16-18]. The polymeric materials made with DCC act as thermoset in certain temperature range and can be thermoplastic under certain conditions through the exchange of covalent bonds and rearrangement of polymer network. Ji and her co-workers used epoxy-acid reaction to make mouldable LCE . The exchange reaction temperature (Tr) is much higher than the liquid crystal-isotropic phase transition temperature (Ti). Thus, the LCE will be aligned into monodomain state upon uniaxial stress at a temperature above Tr. Cooling down below Tr, the LCE acts as thermoset and shows reversible actuation behavior. They also assembled different parts together to build multiple actuating behaviors . Later, Li et al. made an epoxy-based LCE with azobenzene as liquid crystal mesogens, which exhibits photomechanical, shape memory and self-healing properties . Zhu et al. explored molecular design principles in epoxy-based LCE for increasing shape-responsiveness and reducing glass-transition temperature . Yang et al. utilized the photodimerization of cinnamyl groups for crosslinking to make monodomain LCE . McBride et al. reported using reversible addition fragmentation chain transfer (RAFT)-based DCC to make LCE which can change from monodomain to polydomain state under light irradiation . In our group, we incorporated disulfide bonds which can be exchangeable either under high temperature or UV light irradiation into LCE . All the chemicals used in the synthesis are also commercially available. The disulfide LCE can be fabricated from polydomain to monodomain upon either heating or UV light. What is more, there is no catalyst or photoinitiator needed in disulfide exchange reaction. So the disulfide LCE can keep its reprocessibility even being stored for 3 months which is reported for the first time. Figure 3. Design of the disulfide LCE and the mechanistic illustration of the dynamic network of the LCE under UV irradiation or upon heating . Many unusual mechanical behaviors of LCEs have been uncovered since the material was synthesized. For instance, liquid crystal elastomers often exhibit so-called soft elasticity, induced by rotation of mesogens . In the jclub, we will discuss some mechanical behaviors of liquid crystal elastomers studied recently. Viscoelasticity: Recent studies by Azoug et al demonstrated that LCE can maintain high loss factor for a very wide range of loading frequency, which makes the LCE an excellent material to dissipate energy when subject to mechanical loading of a wide distribution of frequency . 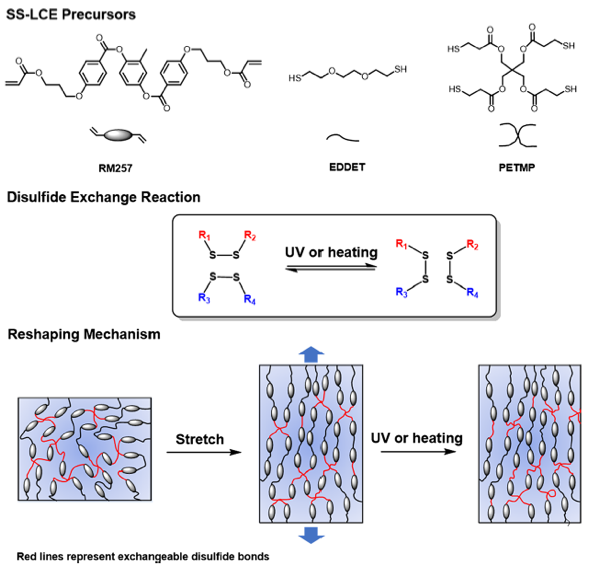 Using LCE as protecting material for impact has been recently proposed by Yakacki and Nguyen. Cyclic loading: Agrawal et al. showed that under repetitive compression of low applitude, polydomain LCE can gradually transit to monodomain LCE with significant increase of material stiffness, which is analogous to muscle development under mechanical stress . Rupture: Our group have recently conducted rupture tests of liquid crystal elastomer . According to our knowledge, our article is the first and probably the only report (till now) of fracture behavior of liquid crystal elastomer. We found that fracture energy of polydomain liquid crystal elastomer can be significantly enhanced by the polydomain to monodomain transition of the material near the crack tip. Because the polydomain LCE is opaque and monodomain LCE is transparent, we can clearly see such transition near the crack tip during the growth of the crack as shown in Figure 4. Such toughening mechanism in LCE is a reminiscent of phase-transition-induced toughening in some ceramics and toughening caused by strain-induced crystallization of natural rubber during fracture. Figure 4 Rupture of polydomain LCE. Without stretch, the LCE smaple is opaue. With the increase of stretch, material near the crack tip becomes transparent, indicating the polydomain to monodomain transition. After the crack propagates through the entire sample, the transparent LCE turns back to opaque, indicating its polydomain state. Thanks to the unique behaviors of liquid crystal elastomers, intriguing applications of various LCE structures have been demonstrated recently. We will briefly introduce some of those applications. More details can be found in the cited references. Ware et al. successfully programed the direction field of the mesogens in LCE with high spatial resolution and demonstrated controllable shape change of LCE film . LCE can be also made to be responsive to light. Using light-responsive LCE, Wani et al. designed a light-driven artificial flytrap, which has the capability of autonomous recognition of objects . Lv et al. realized photocontrol of fluid slug by using liquid crystal polymer actuator . Rogoz et al fabricated light powered soft robot mimicking capterpillar motion using LCE . Our group has also fabricated artificial muscle based on LCE, and some of their performance have been shown to be close or even better than real muscle. Palagi et al. used structured light to generate biomimetic swimming of LCE microrobot . Gelebart et al. generated mechanical waves in liquid crystal elastomer film under constant light illumination . In conclusion, we think LCE is a very interesting soft material. Considering its special molecular structure and unique properties, we believe there will be tremendous opportunities for us to study it and explore its novel applications. 1.Warner, M.; Terentjev, E. M., Liquid crystal elastomers. OUP Oxford: 2003; Vol. 120. 2.Ikeda, T.; Mamiya, J. i.; Yu, Y., Photomechanics of liquid‐crystalline elastomers and other polymers. Angewandte Chemie International Edition 2007, 46, 506-528. 3.Kularatne, R. S.; Kim, H.; Boothby, J. M.; Ware, T. H., Liquid crystal elastomer actuators: Synthesis, alignment, and applications. Journal of Polymer Science Part B: Polymer Physics 2017, 55, 395-411. 4.Ohm, C.; Brehmer, M.; Zentel, R., Liquid crystalline elastomers as actuators and sensors. Advanced Materials 2010, 22, 3366-3387. 5.White, T. J.; Broer, D. J., Programmable and adaptive mechanics with liquid crystal polymer networks and elastomers. Nature materials 2015, 14, 1087-1098. 6.Liu, L.; Geng, B.; Sayed, S. M.; Lin, B.-P.; Keller, P.; Zhang, X.-Q. ; Sun, Y.; Yang, H., Single-layer dual-phase nematic elastomer films with bending, accordion-folding, curling and buckling motions. Chemical Communications 2017, 53, 1844-1847. 7.Ware, T. H.; McConney, M. E.; Wie, J. J.; Tondiglia, V. P.; White, T. J., Voxelated liquid crystal elastomers. Science 2015, 347, 982-984. 8.Buguin, A.; Li, M.-H.; Silberzan, P.; Ladoux, B.; Keller, P., Micro-actuators: when artificial muscles made of nematic liquid crystal elastomers meet soft lithography. Journal of the American Chemical Society 2006, 128, 1088-1089. 9.Yang, H.; Buguin, A.; Taulemesse, J.-M.; Kaneko, K.; Méry, S.; Bergeret, A.; Keller, P., Micron-sized main-chain liquid crystalline elastomer actuators with ultralarge amplitude contractions. Journal of the American Chemical Society 2009, 131, 15000-15004. 10.Cui, J.; Drotlef, D. M.; Larraza, I.; Fernández‐Blázquez, J. P.; Boesel, L. F.; Ohm, C.; Mezger, M.; Zentel, R.; del Campo, A., Bioinspired actuated adhesive patterns of liquid crystalline elastomers. Advanced Materials 2012, 24, 4601-4604. 11.Küpfer, J.; Finkelmann, H., Nematic liquid single crystal elastomers. Macromolecular Rapid Communications 1991, 12, 717-726. 12.Liu, L.; Liu, M.-H.; Deng, L.-L.; Lin, B.-P.; Yang, H., Near-Infrared Chromophore Functionalized Soft Actuator with Ultrafast Photoresponsive Speed and Superior Mechanical Property. Journal of the American Chemical Society 2017, 139, 11333-11336. 13.Yakacki, C.; Saed, M.; Nair, D.; Gong, T.; Reed, S.; Bowman, C., Tailorable and programmable liquid-crystalline elastomers using a two-stage thiol–acrylate reaction. RSC Advances 2015, 5, 18997-19001. 14.Saed, M. O.; Torbati, A. H.; Nair, D. P.; Yakacki, C. M., Synthesis of Programmable Main-chain Liquid-crystalline Elastomers Using a Two-stage Thiol-acrylate Reaction. Journal of visualized experiments: JoVE 2016, 107, 53546. 15.Ahn, C.; Liang, X.; Cai, S., Inhomogeneous stretch induced patterning of molecular orientation in liquid crystal elastomers. Extreme Mechanics Letters 2015, 5, 30-36. 16.Bowman, C. N.; Kloxin, C. J., Covalent adaptable networks: reversible bond structures incorporated in polymer networks. Angewandte Chemie International Edition 2012, 51, 4272-4274. 17.Wojtecki, R. J.; Meador, M. A.; Rowan, S. J., Using the dynamic bond to access macroscopically responsive structurally dynamic polymers. Nature Materials 2011, 10, 14-27. 18.Zhang, W.; Jin, Y., Dynamic Covalent Chemistry: Principles, Reactions, and Applications. John Wiley & Sons: 2017. 19.Pei, Z.; Yang, Y.; Chen, Q.; Terentjev, E. M.; Wei, Y.; Ji, Y., Mouldable liquid-crystalline elastomer actuators with exchangeable covalent bonds. Nature Materials 2014, 13, 36-41. 20.Pei, Z.; Yang, Y.; Chen, Q.; Wei, Y.; Ji, Y., Regional shape control of strategically assembled multishape memory vitrimers. Advanced Materials 2016, 28, 156-160. 21.Li, Y.; Rios, O.; Keum, J. K.; Chen, J.; Kessler, M. R., Photoresponsive liquid crystalline epoxy networks with shape memory behavior and dynamic ester bonds. ACS Applied Materials & Interfaces 2016, 8, 15750-15757. 22.Zhu, B.; Barnes, M.; Kim, H.; Yuan, M.; Ardebili, H.; Verduzco, R., Molecular engineering of step-growth liquid crystal elastomers. Sensors and Actuators B: Chemical 2017, 244, 433-440. 23.Yang, R.; Zhao, Y., Non‐Uniform Optical Inscription of Actuation Domains in a Liquid Crystal Polymer of Uniaxial Orientation: An Approach to Complex and Programmable Shape Changes. Angewandte Chemie International Edition 2017, 56, 14202-14206. 24.McBride, M. K.; Hendrikx, M.; Liu, D.; Worrell, B. T.; Broer, D. J.; Bowman, C. N., Photoinduced Plasticity in Cross‐Linked Liquid Crystalline Networks. Advanced Materials 2017, 29, 1606509. 25.Wang, Z.; Tian, H.; He, Q.; Cai, S., Reprogrammable, Reprocessible, and Self-Healable Liquid Crystal Elastomer with Exchangeable Disulfide Bonds. ACS Applied Materials & Interfaces 2017, 9, 33119-33128. 26.Azoug, A.; Vasconcellos, V.; Dooling, J.; Saed, M.; Yakacki, C.; Nguyen, T., Viscoelasticity of the polydomain-monodomain transition in main-chain liquid crystal elastomers. Polymer 2016, 98, 165-171. 27.Agrawal, A.; Chipara, A. C.; Shamoo, Y.; Patra, P. K.; Carey, B. J.; Ajayan, P. M.; Chapman, W. G.; Verduzco, R., Dynamic self-stiffening in liquid crystal elastomers. Nature Communications 2013, 4, 1739. 28.Fan, W.; Wang, Z.; Cai, S., Rupture of Polydomain and Monodomain Liquid Crystal Elastomer. International Journal of Applied Mechanics 2016, 8 (07), 1640001. 29.Wani, O. M.; Zeng, H.; Priimagi, A., A light-driven artificial flytrap. Nature Communications 2017, 8, 15546. 30.Lv, J.-a. ; Liu, Y.; Wei, J.; Chen, E.; Qin, L.; Yu, Y., Photocontrol of fluid slugs in liquid crystal polymer microactuators. Nature 2016, 537, 179-184. 31.Rogóż, M.; Zeng, H.; Xuan, C.; Wiersma, D. S.; Wasylczyk, P., Light‐Driven Soft Robot Mimics Caterpillar Locomotion in Natural Scale. Advanced Optical Materials 2016, 4, 1689-1694. 33.Gelebart, A. H.; Mulder, D. J.; Varga, M.; Konya, A.; Vantomme, G.; Meijer, E.; Selinger, R. L.; Broer, D. J., Making waves in a photoactive polymer film. Nature 2017,546, 632-636. Permalink Submitted by Zhigang Suo on Tue, 2018-01-02 08:56. In Ref 28, you reported for the first time the rupture behavior of liquid crystal elastomers. Toughening due to phase transition and variant switching has long been known in metals and ceramics. Some of these materials have been used in practice. Your report on the similar behavior in liquid crystal elastomers is interesting. Can you talk more about potential practical significance of this toughening mechanism for liquid crystal elastomers? Permalink Submitted by Cai Shengqiang on Tue, 2018-01-02 13:26. One application of LCE people (Vicki Nguyen, Yakacki, etc.) recently proposed is to use LCE as protective material by taking advantage of its large damping capability. In those applications, tough LCEs are needed. We also explore LCE as soft actutors, where LCE with high toughness is also desired. Permalink Submitted by Zhigang Suo on Thu, 2018-01-04 11:48. Hybrid covalent bonds and weak bonds enable entropic elasticity of elastomers. It will be good that we point to more examples that highlight the link between chemistry and mechanics. Permalink Submitted by Cai Shengqiang on Thu, 2018-01-04 12:34. Thanks for pointing out the more general theme of using chemistry to change mechanics. There are definitely more examples, in particularly for polymers. I will come back to this later. How large the typical fracture toughness of LCE is? Permalink Submitted by Xiaoyan Li on Tue, 2018-01-02 22:13. Hi Shengqiang, it is really very interesting work! I am interested in the fracture behaviors of liquid crystal elastomers (LCEs), especially novel toughening mechanism. You and your colleague had performed impressive experiments on the cracked samples. The pronounced crack blunting indicates high fracture toughness of LECs. I have few questions, how large the typical fracture toughness of LCEs is? Is this property related to the initial orientation of liquid crystal molecules? If the sample is a monodomain (similar to single crystal), how it dissipates the energy during fracture? Thank you very much in advance! Permalink Submitted by Cai Shengqiang on Wed, 2018-01-03 13:28. The typical toughness for our LCE sample is around 1KJ/m^2. Yes, it depends on the initial orientation of the LC molecules. The polydomain without texture LCE can double the fracture energy. We believe the energy dissipating mechanims in mondomain LCE should be similar to most polymeric elastomers: viscoelasticity, breakage of polymer chain, etc, will be involved. One more energy dissipating mechanism exsit in polydomain LCE, which is polydomain-monodomain transition. Lambda_pre is used to allign the LC molecules. For lamdba_pre=1, the LCE is polydomain without texture. Please let me know if I answered your questions or not. Permalink Submitted by Xiaoyan Li on Wed, 2018-01-03 21:04. Hi Shengqiang, Thank you very much for your helpful and comprehensive reply. It is amazing that the fracture toughness of LCE is comparable to that of conch shell in nature. The LCE might have the lower density than the shell. So the specific toughness (ratio of toughness over density) of LCE might be higher than that of the shell. Therefore, LCE will have abroad applications in light-weight structural components, mechanical actuation and energy damping. I will carefully read your paper and learn the knowledge of LCE from your paper. Thank you very much again. Permalink Submitted by Jiawei Yang on Thu, 2018-01-04 14:32. Then the LCE is an anisotropic material, will you get different toughness in different loading direction? Permalink Submitted by Cai Shengqiang on Sat, 2018-01-06 00:41.
the anisotropicity of the fracture toughness in LCE is actually not very large as shown in our paper. we do not fully understand it. Permalink Submitted by Shuang Zhou on Tue, 2018-01-02 22:50. Hi Shengqiang, thank you for this very timely review. Your work on LCE fracture energy is impressive. This brings up interesting questions to me. First one: do we have a deep understanding how LC director determines the polymer chain order? The scalar order parameter in a thermotropic LC is usually not large, say 0.6-0.7. This means the molecular orientation distribution is only weakly prolate, actually closer to spherical. Depending on the way LC attaching to the polymer backbone (side chain side on, or side chain end on) the polymer chain can be prolate or oblate. But across the nematic to isotropic phase transition, the LCE can shrink to 1/3 of its nematic length. The "scalar order parameter" of polymer backbone in the nematic LCE, if we do an analogous definition as LC molecules, would be close to 1. Polymer chains seem much more ordered than the LC host. This is a puzzle to me. The following question is how polymer chains managed to have such high anisotropy. Is it because of a biased radical reaction? In the disulfide approach, the reconfiguration of bounds seem releases some stress to keep monodomain status. But what exactly happened? In your fig 3, the last two panels are actually the same in molecule configuration on a macroscopic average. Could you please explain more? Thank you! Permalink Submitted by Cai Shengqiang on Wed, 2018-01-03 23:10. Thanks for your interest. I copied here zhijian wang (postdoc in our group)'s response to your question. He is waiting for the approval of his imechanica account. In our experiments, the LCE are main-chain liquid crystalline polymers with extended spacers and crosslinking agents connecting LC mesogens. The extended spacers are flexible. We can decouple the motion of liquid crystal mesogens and polymer chain. However, if you increase the crosslinking density, the coupling effect can not be ignored. In addition, in two-step polymerization method, we used mechanical stretching to align the liquid crystal mesogens. There are two kinds of polymer chains in the final monodomain LCE, stretched polymer chain formed in first polymerization step and ideal polymer chain newly formed in second polymerization step. The initially formed polymer network would limit the complexity in LCE structures. In dynamic covalent chemistry method, the initially formed polymer network will break and form (rearrange) through the exchange reaction. The stress is released during this process and polymer chains transits from stretched state to stress-free state. If the processing time is comparable to the exchange reaction time, the elasticity stored in the stretched polymer chains will be released and the obtained LCE stays in the processed monodomain state. In Fig 3, the exchange reaction results in the rearrangement of polymer chain and release the stress. If you have any confusions, please let me know. Permalink Submitted by Cai Shengqiang on Thu, 2018-01-04 00:41.
referring to your question about order parameter change: here is an intrinsic difference between liquid crystal and liquid crystal elastomer. in LCE, liquid crystal are connected head-to-end to form a polymer chain (for main-chain LCE). a relatively small order parameter change can induce large deformation. There are well-etablished equation for such relationship. For example, the first paragraph in p3 of the following paper. Permalink Submitted by 706430871@qq.com on Wed, 2018-01-03 12:03. Thank you, Shengqiang. Very interesting and impressive work. I have questions regarding the dynamic covalent chemistry. 1) For the disulfide exchange reaction in Fig.3, why is the forming of R1-S-S-R3 more favorable than the forming of R1-S-S-R2, meaning that why does the LCE shrink/elongate upon UV or heating? What if UV/heating is applied on unstretched LCE sample? 2) It's easy to understand the self-healing properties of disulfide bonds (red lines in reshaping mechanism in Fig.3). But there are many covalent bonds (black lines) that cannot be healed. To what extent can a LCE restore its properties? How does the amount of disulfide bonds affect the healing performance? 3) How fast can a LCE response to the stimuli? Miniaturizing the sample, of course, works. What's the fundamental limits? Thank you. Permalink Submitted by Cai Shengqiang on Wed, 2018-01-03 23:38. Figure 3 is a sketch for the exhanging reaction. All possible exchanging reaction can happen. Figure 3 just shows one possbility. When Disulfide LCE sample is prestretched, new bonds will form if the stress/strain energy can be reduced. Therefore, after the completion of exchanging bond reaction, the stress decreases almost to zero in the prestretched sample, and thus the mondomain configuration is fixed. If the LCE sample is not prestretched during the UV/heating, exchanging bond reaction also happens, while the isotropic crosslinked network will be maintained. In our self-healing test, the strength of the self-healed LCE sample can reach almost 80% of its prestine state. The phase transition of Liquid Crystal molecules is typically very fast (I actually have no idea about the time scale, but there should be some reports on this, at least in liquid state). In real applications, thermal-actuation speed of the LCE sample is usually determined by the time for thermal diffusion. Permalink Submitted by Zhijian Wang on Thu, 2018-01-04 11:50. For your first question, the forming of R1-S-S-R3 is not more favorable than the forming of R1-S-S-R2 in our case. The chemical structure is symmetric on both sides of disulfide bonds. R1,R2,R3 and R4 are the same. The exchange reaction keeps happening under UV/heating. If they are different, there should be some preference in the final products and they would reach an equilibrium ratio under UV/heating after enough reaction time. THe free-standing LCE shrink/elongate upon heating results from liquid crystal-isotropic phase transition. The UV or heating above reaction temperature is used for processing LCE from polydomain to monodomain state. Without UV or heating above reaction temperature (Tr), you can regard the LCE as thermoset which shows phase transition above isotropic temperature(Ti) (Ti is far below Tr) as common LCE materials. Permalink Submitted by Jiawei Yang on Thu, 2018-01-04 12:05. If R1,R2,R3,R4 are same, the exchange reaction can also reversed under heat/UV, right? Permalink Submitted by Zhijian Wang on Thu, 2018-01-04 12:27. Sure. They are reversible. In fact, the exchange reaction is reversible even though R1,R2,R3,R4 are not same. They will reach an equilibrium state after enough time but the exchange reaction is still happening. Disulfide bonds are really interesting. They can undergo thiol-disulfide exchange in the presence of base, they can also be exchangeable through free radical intermediated mechanism. The reaction temperature varies from room temperature to 180 oC through changing the chemical structures of R1,R2,R3,R4 or adding catalysts. Permalink Submitted by Jiawei Yang on Thu, 2018-01-04 12:06. Permalink Submitted by Jiawei Yang on Thu, 2018-01-04 12:09. Thanks for the reference from George. We also noticed it. Permalink Submitted by Pradeep Sharma on Wed, 2018-01-03 17:00. Hi Shengqiang, thanks for the nice overview on LCE's---which I very much enjoyed reading. Your timely article prompted me to explore this further by reading a few of the papers you cited and others that I have found on my own. What, in your opinion, are the open issues related to modeling of LCE's? There appears to be considerable work on that by physcists and only a little from mechanicians. Permalink Submitted by Jinxiong Zhou on Wed, 2018-01-03 18:41. Hi Pradeep, We do very few work on modeling of LCE. One way of realizing light-sensitive LCE is to add some carbon nanotubes into thermal-sensitive LCE. Torras et al. performed an experiment on bending kinetics of a LCE cantilever with irradiation of light (Torras et al., APL., 2011, 254102) and measured the temperature rise inside LCE due to the heat-light conversion of carbon nanotubes. Based on their experimental results, we performed a finite element modeling of temperature filed distribution in LCE cantilever beam. Inputing some parameters such as power of light source, distance between the light and the cantilever, material and thermal properties of the LCE, we can model the 3D temperature distribution in LCE. The modeling was completed by using a multiphysics software, COMSOL. Take a look at the paper if you have interests. Another interesting topic on modeling of LCE is the instability of LCE. LCE will shrink in director direction but expand in other two directions perpendicular to director direction if the LCE is heated. Exploring this mechanism and deformation can design various devices that generate on-demand instabilities. Laminating a reigig PS film on top of LCE film gives a LCE-PS bilayer. The LCE-PS bilayer would exhibit wrinkling and folding instability depends on the thickness ratio of LCE and PS. If a LCE bar is constrained in the direction normal to the director direction, the constrained LCE bar would undergo typical Euler buckling instability. We performed a FEM simulation of these instability by implementing the phase-transition curve of LCE into ABAQUS. The details of the paper can be found here. Permalink Submitted by Cai Shengqiang on Wed, 2018-01-03 23:05. Thanks for your comments. I know your work on modelling of LCE. I should have cited your paper in the review. Permalink Submitted by Cai Shengqiang on Wed, 2018-01-03 23:02. In my opinion, there are lots of opportunities for modeling the mechanical behaviors of LCE. For example, a good 3d constitutive model of LCE, taking account of the phase transtion or texture evolution (for instance polydomain to mondomain transition), is generally not avaible. In addition, the mechanical behaviors of LCE can be strongly affected by its preparation. A mechanics model with carefully considering the preparation process is also not available. Moreover, viscoelasticity and plasticity can be often observed during the deformation of LCE. However, according to my knowledge, there is no good models for those features either. Permalink Submitted by Jinxiong Zhou on Wed, 2018-01-03 18:55. Hi Shengqiang, thank you for organizing such a wonderful discussion on this thread and congratulations for wonderful work on LCE. I would like to mention another interesting application of light-sensitive LCE: artificial heliotropism for solar energy harvesting by Hongrui Jiang's group. The paper can be found here. Permalink Submitted by Cai Shengqiang on Wed, 2018-01-03 23:06. Yes, Jinxiong. I know Hongrui's work also. As mentioned in the review, the cited references are far away from complete. Many interesting work on LCE has not been cited. Permalink Submitted by tongqing.lu on Thu, 2018-01-04 02:53. 1. When you pull a sample of LCE, what do we obtain from the stress-strain curves to confirm that the phase transition occurs? Or what macroscopic quantity do you think is directly related to the phase transition? 2. When you load and unload the sample, it becomes transparent or opaue. If you do a cyclic test, the transparency may vary. As you mentioned from Ref , the polydomain LCE can gradually transit to monodomain LCE with significant increase of material stiffness. What leads to the one-way change? Is there any damage? Permalink Submitted by Cai Shengqiang on Thu, 2018-01-04 14:32. 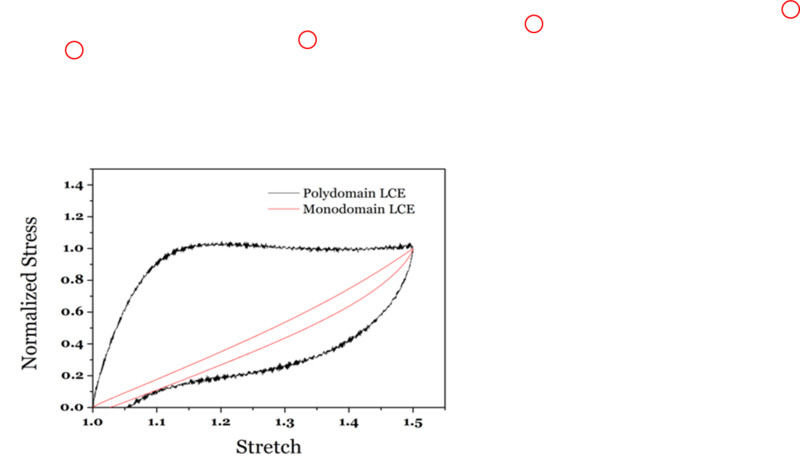 For a polydomain LCE, you can see a stress plateau in the stress-strain curve, which correspond to polydomain to monodomain transition, which some people call is (semi) soft elasticity. It is not phase transition. Stretch-induced phase transition (nematic-to-amorhphous ) in LCE has been less often observed. I remebered there are some report on this. The aimbient temperature has to be closer enough to the phase transition temperature. It is probably because the strain energy still cannot compete with the free energy of phase transition in liquid crystals. For your problem 2, I do not have clear answer for the time being. We are conducting some similar studies in the lab. We believe viscoplasticity in the LCE has to play a role for such permanent change of molecular allignment. Permalink Submitted by Jiawei Yang on Thu, 2018-01-04 12:02. Thank you Shengqiang for the consice review. In conjection with Canhui's question, I also have questions in Fig.3. 1. In the synthesis of SS-LCE (the first scheme), how do the three chemicals polymerize into a elastomer network? For polymerization, you do need initiator, right? I am not sure how to couple the LC and the disulfide molecules. 2. Does the disulfide exchange reaction occur under heat/UV depend on the substituents of R groups? To be specific, why this reaction goes into right direction? I think this must relate with the stability of bond which may be depend on the substituents of R groups. 3. How much time do you need to stretch and hold the the sample before the LC form monophase? Permalink Submitted by Zhijian Wang on Thu, 2018-01-04 13:47. 1. There two steps in the synthesis. First, the thiol groups of chain extender EDDET reacted with vinyl groups of RM257 through Michael addition reaction. The EDDET is excessive so that we obtained oligomers with thiol groups as end groups. Then, in the second step, we added crosslinker PETMP, oxidized agents H2O2 and catalyst NaI to initiate the reaction between thiol groups. The polymerization here is step-polymerization. There is no initiator needed. 3. In our experiments, we placed the stretched LCE under UV light for 1 h.
Permalink Submitted by Qihan Liu on Thu, 2018-01-04 13:11. 1. When you fracture a piece of LCE, does S-S bonds break before C-C bonds? Or in other words, will S-S bonds crosslinked elastomer have similar fracture energy as C-C bonds crosslinked elastomer? 2. The disulfide metasis reaction involves radicals, right? Then how stable are the material under UV and high temperature with the exposure? Do you ever observe aging of the material over prolonged usage? Permalink Submitted by Cai Shengqiang on Thu, 2018-01-04 13:31. Thanks for the questions. Both are great questions. 1. We believe s-s bond will be eaiser to be broken, compared to c-c bond. There have been studies showing force alone can break s-s bond and induce exchanging reactions. In terms of fracture energy of elastomer, as we know, for most loading conditions, the energy of breaking bond does not contribute much to the fracture toughness of an elastomer. Viscoelasticity, plasticity and also cavity formation etc will all contribute to the fracture energy of elastomer, which makes the measured fracture energy often order of magnitude larger than so called threshold fracture energy. 2. As a matter of fact, we are studying it. In general, we do expect material property change when it is exposed to UV and high temperature. In our LCE, the generation of free radicals will simply initiate bond exchanging reactions, instead of other side-reactions. But, in general, the free radial from breakage of S-S bond may induce other side reactions in the elastomer. Permalink Submitted by Xuanhe Zhao on Thu, 2018-01-04 13:46. Thanks for the very impressive and inspiring work and the nice summary on liquid crystal elastomers! As you mentioned, the physics of LCE has been extensively studied over years, but there still lack quantitative mechanics models. I have two questions, one on the practical applications and the other on facture of LCE. 1. What are the advantages of LCE over other soft active materials in practical applications such as shape-memoery polymers, dielectric elastomers and responsive hydrogels, on some of which you also did impressive works? 2. Can we understand the total fracture toughness of LCE as synergiestic contributions from intrinsic fracture energy and dissipation from phase transition? Here is a model based on this idea to calculate fracture toughness and adhesion energy of soft tough materials. Hope it may be relevant. Permalink Submitted by Cai Shengqiang on Thu, 2018-01-04 14:45. Thanks for your insterest and questions. As a soft actuating material, LCE has some uniquene properties, compared to other mateirals. LCE was also regarded as a two-way shape memory polymer by some researchers. Compared to the shape memory polymers relying on glass transition/crystallization, LCE does not change its stiffness much during actuation, because it stays in elastomer state. The acutation of LCE can be triggered by different stimuli: heat, light etc. The speed is generally much faster than responsive hydrogels (thermal diffusivity is several orders of mangnitude higher than water diffusivity). We realized dynamic actuation of LCE with centimer size up to 0.3 HZ (can be even higher with some opimization) using joule heating. We also showed laster-induced localized deformation in LCE can be less than 0.1 second. Yes, I like both of your papers about estimating fracture toughness of polymer. We can quantitatively understand the fracture toughness of LCE using a similar way presented in your paper. I did a back-of-envelope of calcualtion, which was not in the paper. Permalink Submitted by Jinxiong Zhou on Fri, 2018-01-05 00:56. Hi Shengqiang, I have a thought on possible limitation of light-sensitive LCE. One unique feature of LCE is that it can be triggered by remotely controlled light source. I thick light sensitive LCE material should be synthesized into thin films to make it more effective. For bulk materials, it is hard to use its light-sensitivity because only its surface layer would work. Am I right? Permalink Submitted by Cai Shengqiang on Fri, 2018-01-05 01:04. Yes. I agree in general. It is probably the limitation for most light-sensitive material. In some senarios, if light-induced inhomgenous deformation is desired, LCE with the thickness larger than the light-peneration depth can still work. We made LCE samples typically with diameter for rod or thickness for thin film around several mms. Large, fast, precisely-controllable and reversible bending can be easily realized in the material using laser. Permalink Submitted by Jinxiong Zhou on Fri, 2018-01-05 00:42. Hi, Xuanhe, let me try to partly answer your first question on the application of LCE. Compared with dielectric elastomer and hydrogels, LCE shows higher modulus but still can exhibit pretty large deformation, up to several hundreds percent in the record. This unique to other soft materials with relatively low modulus. Actuators made of high modulus materials thus can give higher output forces, which is needed for many applications. Permalink Submitted by Lihua Jin on Thu, 2018-01-04 17:37. Dear Shengqiang, timely review and great achievement! Thanks for particularly tailoring the review for the interests of mechanicians. Thanks Pradeep for pointing out the need of mechanical models. Here is our early paper on 3D constitutive model of LCEs. The field is still widely open. Permalink Submitted by Zhigang Suo on Thu, 2018-01-04 18:05. Lihua, thank you for the link to your paper. What is needed for modeling beyond your paper? Permalink Submitted by Lihua Jin on Thu, 2018-01-04 23:41. Thanks, Zhigang. In our paper, we model the free energy of LCEs as the combination of an elastic energy and a phenomenological Landau phase transition energy. The LCEs are modeled as completely 'soft', i.e. the director rotates following the mechanical deformation. However, in reality, researchers observe 'semi-soft' behavior, i.e., large enough energy is needed to rotate the director. There are indeed efforts to model the 'semi-soft' behavior, and to better understand the mechanics of polydomain-monodomain transition. Other than that, it is needed to develop a physical model for the phase transition energy, to take into account in the model the fabrication history and rate-dependence (ref 26) of LCEs. Modeling inhomogeneous deformation of LCEs is also interesting, such as all kinds of actuations, instability and fracture. Permalink Submitted by Cai Shengqiang on Thu, 2018-01-04 23:45. Thanks, Lihua. I also knew your eariler efforts in modelling LCE with Yongzhong. I should have cited those papers in the review. Permalink Submitted by Jinxiong Zhou on Fri, 2018-01-05 00:49. Hi, Lihua, I read yourexcellent paper with Prof. Huo. I agree with you that modeling inhomogeneous deformation of LCE is very interesting since several work on wrinkling of LCE was also reported. Researchers can follow the strategy on modeling inhomogeneous deformation of hydrogel and write a UMAT subroutine and embed it into ABAQUS. Do dou know anyboy has tried to do this? Permalink Submitted by Cai Shengqiang on Fri, 2018-01-05 00:57. We did some search on this. We cannot find any abaqus subroutine for LCE. It can be generally difficult, because of the involvement of phase transition. Permalink Submitted by Lihua Jin on Fri, 2018-01-05 01:28. Jinxiong and Shengqiang, we implemented a LCE model into a FEM code in the following paper. Unfortunately, at that time, I wasn't good at Abaqus, so I implemented based on the software, FEPG, which you can essentially write the weak form. I know Prof Yongzhong Huo is still working on FEM implementation, but I don't know whether it's based on ABAQUS. Permalink Submitted by Pradeep Sharma on Sat, 2018-01-06 14:09. Thanks to all of you commented on the modeling aspects of LCE's. I feel more motivated to look into some of these aspects now. Permalink Submitted by hgaksoy on Thu, 2018-01-11 02:56. Thank you very much for the review and comments on an interesting topic. Concerning the modelling of LCE majority of the studies are based on the work of Trentjev and coworkers. Rubber elasticity is coupled with the nematic liquids in order to have a thermodynamically consistent constitutive relation. How about assuming that LCE is a micropolar media following the work of Eringen ? Could it help on modelling the semi-soft behavior. A.C. Eringen, 'A Unified Continuum Theory of Electrodynamics of Liquid Crystals', International Journal of Engineering Science, Vol. 35, pages: 1137-1157, 1997. Permalink Submitted by omkar.nadgir on Fri, 2018-01-19 07:29. Thank you for starting this discussion thread here and many congratulations on your achievements. I have a question regarding the model presented in your publication. The equation (14) is the expression for Cauchy stress tensor and normally it is unsymmetric due to the considered neo-classical energy. In absence of inner couples however, it is symmetric in nature. In my understanding, uniaxial tension test (perpendicular to the direction of nematic director) induces rotation of mesogens which in turn applies some torque or inner couple on the body. My question now is, how can one ensure the absence of inner couples in classic boundary value problems e.g. uniaxial tension test? Is considering LCEs as a micropolar material an option, as suggested by hgaksoy? Permalink Submitted by Lihua Jin on Sat, 2018-01-20 01:13. Thanks for sharing your paper. It's very interesting. I think you are abosolutely right about the stress tensors and rotation of mesogens. Then the boundary condition absent of inner couple becomes non-physical. I don't really know the answer to your question. I think you can decouple the total deformation gradient to elastic part and the part due to mesogen rotation, although these two are highly coupled. Permalink Submitted by omkar.nadgir on Wed, 2018-02-07 04:56. Thanks alot for your comment. I really appreciate your inputs on this subject. Permalink Submitted by Zhigang Suo on Fri, 2018-01-05 08:44. Many dynamic covalent chemistries exist. You noted that people have used various dynamic covalent chemistries for LCE. You introduced disulfide for LCE. In your paper you discussed briefly about the attributes of disulfide for LCE. Can you expand this discussion and compare various dynamic covalent chemistries for LCE? Permalink Submitted by Rong Long on Fri, 2018-01-05 09:37. I have been interested in dyanmic covalent chemistry (DCC) for some time and can add a few references that I know. Prof. Leibler and colleagues at ESPCI used transesterifcation reactions in epoxy networks to achieve DCC (Montarnal et al. 2011). Prof. Guan's group at UC Irvine used olefin metathesis in polybutadiene networks (Lu & Guan 2012). Prof. Zhang's group at CU Boulder used imine chemistry to acheive DCC (Taynton et al. 2016). These works mainly aim to make the covalently crosslinked network malleable and recyclable. I am also curious about what are the limitations on combining various DCC mechanisms with LCE? Permalink Submitted by Zhijian Wang on Fri, 2018-01-05 12:30. I am impressed by your excellent work on modeling of DCC. Most DCCs are mainly used for make thermoset polymer network recyclable and malleable. It is a big breakthrough for the fabrication. I think most of the work focuses on the chemistry. Processing monodomain LCE is a special case of the malleable properties of DCCs. The polymer network must be stable around the actuation temperature. Permalink Submitted by Zhijian Wang on Fri, 2018-01-05 12:22. Thanks for your interest. We can simply regard the LCE as two parts: liquid crystal and polymer network. The dynamic covalent chemistry is used for processing LCE from polydomain to monodomain through exchange reaction. The actuation property of LCE is attributed to the phase transiton of liquid crystal. When we want to use LCE as actuators, LCE should be thermoset without any exchange reaction. Otherwise, the actuation properties will disappear after several cycles. We tried several kinds of dynamic covalent bonds to make LCE. Like RM257, most liquid crystals have liquid crystal-isotropic temperature (Ti). For thermo-triggered dynamic covalent bonds like epoxy-acid system, they have reaction temperature (Tr). Tr should be much larger than Ti. We can process LCE from polydomain to monodomain above Tr. When cooling down, the monodomain state is fixed. When the monodomain LCE is used as actuator around Ti, the polymer network is thermoset and doesn't rearrange. The actuation behavior results from the phase transition of liquid crystal mesogens. Ji and her coworkers discussed it in Ref . If Tr is close or lower than Ti, when LCE is heated above Ti, it will contract. However, the exchange reaction also happens andhe polymer network rearranges. After several times or heating above Ti for enough time. LCE will change back to polydomain state. The Tr for imine chemistry and olefin metathesis are lower than 80 oC. They are not suitable for RM257-type liquid crystal mesogens. We tried imine chemistry and didn't obtain monodomain LCE. The disadvantage of thermo-triggered DCC for LCE is that when we heat LCE above Tr which is much larger than Ti, LCE will contract and generate large stress. Usually, people use creep experiment to align it slowly. It is diffcult to control the actuation strain, stress. For photo-triggered DCC based LCE, the situation is much simpler. In Ref 24, Bowman and his coworkers reported RAFT-based DCC to make LCE. The RAFT exchange reaction can be triggered by light in the presence of photoinitiator. After initiaor is consumed, LCE is thermoset and can not change from polydomain to monodomain. Disulfide exchange reaction can be triggered either under heat and UV light. The reaction temperature (Tr) depends on the substitute groups (R), catalyst and base. In our work, Tr for disulife exchange reaction is much higher than Ti of liquid crystal mesogens we used. So disulfide LCE can be processed through heating. Disulfide exchange reaction can also be triggered under UV light without any photoinitiator. It can be processed for many times and stored for long time. Permalink Submitted by Cai Shengqiang on Fri, 2018-01-05 13:59. 3. The temperature to trigger such reaction is very tunable (which is important for LCE application, since actuation of LCE is often thermally triggered also.) The reaction temperature can be tuned by varying the chemical groups linked to disfuldie bond. The temperature can be also lowered down by simply diffusing in a small amount of catalyst. Permalink Submitted by Cai Shengqiang on Fri, 2018-01-05 13:49.
thanks for your question. Zhijian and I have been talking about writting a review paper focusing on dynamics bond in LCE. Permalink Submitted by Rong Long on Fri, 2018-01-05 09:14. 1. You mentioned that the polydomain-to-monodomain transition is a possible toughening mechanism for LCE. Is there any bulk mechanical testing data (e.g. uniaxial tension) showing hysteresis and dissipation solely caused by this transition? I would guess this may be not straightforward in experiments since viscoelasticity is also present, as you pointed out, and can also lead to hysteresis. I ask this question because even in elastic networks, stretch can also cause alignment of chains as shown in a few Molecular Dynamics simlations (e.g. Bergstrom & Boyce 2001, Yang et al. 2015), but such chain alignment does not cause any energy dissipation. Also, the opaque-to-transparent transition during a fracture test is very interesting! Is it possible to engineer this transition and use it as a strain/stress indicator? 2. The usage of DCC to help align the monodomain in LCE is inspiring. Are there any models to guide this process, e.g. the stretch, irradiation intensity, and irradiation time required to achieve a certain degree of the monodomain? Permalink Submitted by Cai Shengqiang on Fri, 2018-01-05 13:38. For question 1, yes, we see much larger hystereis loop in polydomain LCE sample than more alligned monodomain LCE. see the figure below (unpublished raw data). The black curve is for a polydomain LCE, while the red one if for a monodomain LCE. Both LCE are synthesized in the same condition. The only difference is the allignment of LC molecules. I did a rough quantitative estimation. The hysteresis can indeed lead to the fracture toughness increase measured in our fracture experiments. We also had a paper published in EML last year, using the transparency transition in LCE to visulize the strain. For question 2, it is a great question. For a LCE, a mechanics (chemo-mechanical) model to link its synthesis procedure and performance is highly desired, which is also (in my opinion) a great opportunity for us mechnician. In particular, during the synthesis of LCE, mechanical load is often applied. If you have interest in modelling it, we can discuss about it in details. Permalink Submitted by Refat_Islam on Fri, 2018-01-19 12:24. You mentioned that the stress plateau corresponds to polydomain-to-monodomain transition (random to chain alignment) of LCE. However, in elastic network literature, alignment is typically associated with network stiffening whereas stress plateau indicates instability or locking of structure (for example, polymeric foam under compression). It is very interesting that the plateau persists at such large stretch without any stiffening. Do you think this is more material specific effect rather than geometric effect? Permalink Submitted by Arda on Mon, 2018-01-29 15:36. Hi Shengqiang, thanks for a great review! I’d like to add that LCE architectures have traditionally been limited due to processing constraints, which generally limits LCEs to 2D or unidirectional architectures. We recently were able to align the director to arbitrary printpaths through extrusion. With this 3D printing method, we can now fabricate interesting architectures with programmed properties in 3D. This method of director alignment has virtually no limitation in dimension and will allow previously unattainable LCE architectures! Paper can be found here. Permalink Submitted by Zhijian Wang on Tue, 2018-01-30 00:48. Thanks for your reply. We have read your work carefully. Really wonderful! 3D printing of LCE provides lots of opportunities in structure design.